Last weekend Mum and I went to Ballan, a little town of about 2,500 people, just outside Melbourne. We were going to see an exhibition of Japanese quilts by Shigeko Asada. Shigeko died in 2005 after eight years fighting cancer. 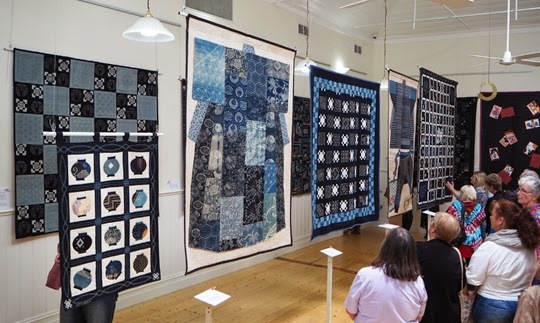 To help her cope and give her strength, she made a series of 50 quilts, many that were on display for the first time outside Japan in this small Victorian town. 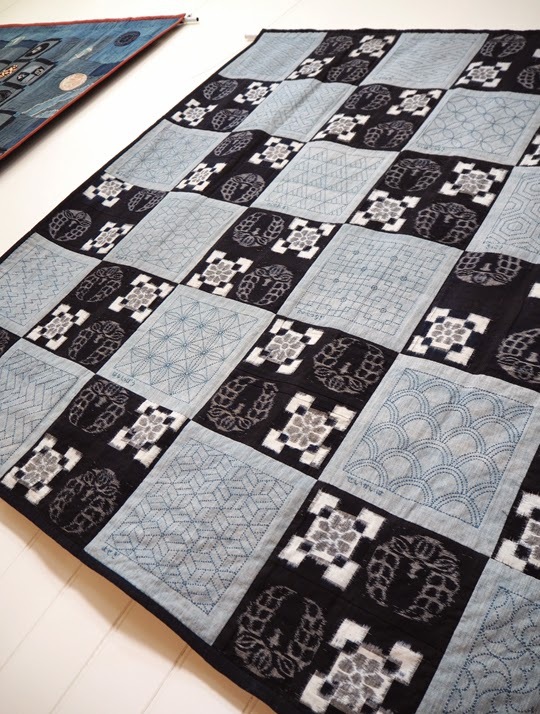 Most of the quilts were hand pieced and often hand quilted and they contained the most beautiful details – sashiko embroidery, old bed sheets that had been plant-dyed and used to create embroidered cherry blossoms and hand stitched Buddhist sayings. No.3 Mother Sea – raising life (early works). 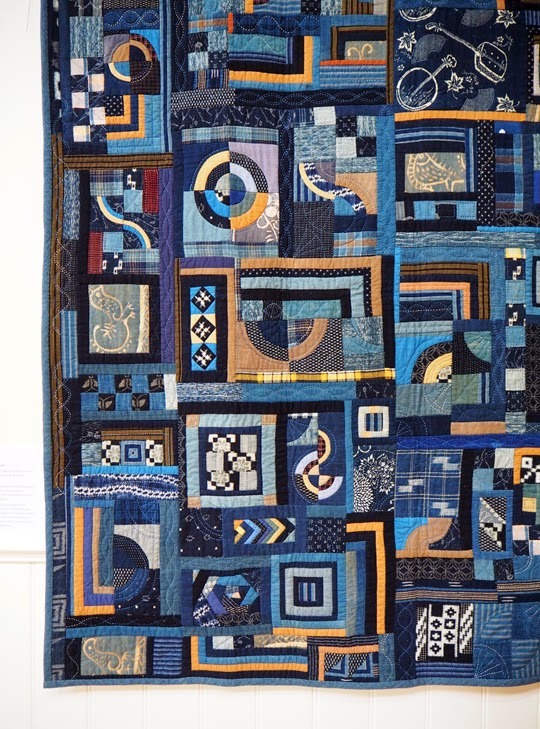 The majority of the quilts in the exhibition were made with kasuri. Kasuri is a Japanese form of ikat, where the cotton threads are indigo-dyed before being woven. The pattern in the cloth often bleeds a little where the threads don't quite match up to the intended design. I find this technique quite astonishing that they can get it to match up at all! Shigeko tells the story that kasuri were created by women during the winter or the evenings when there was no farm work. The finished pieces were given to daughters to take with them when they left the family home as brides. For Shigeko, the smell of indigo is the smell of her mother. No. 4 Memories of Childhood (early works). 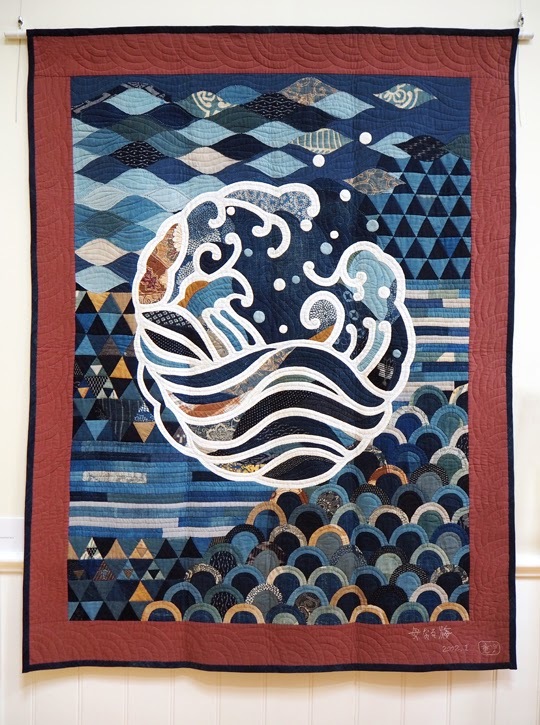 The quilt below was made to highlight the Japanese art of sashiko – the beautiful stitch patterns that were used to strengthen and mend materials. The pieces of kasuri in this quilt are nenneko, which was a special style of padded kimino used while carrying a baby to keep it warm. Traditionally these types of kimino were used to make nappies once they wore out. No waste in those days. No. 9 Sashiko stitching and kasuri – traditional sashiko patterns being forgotten. This next quilt contained some of my favourite details – appliqué trees and hills, with sky and moutains in the distance – and just look at those dragonflies. 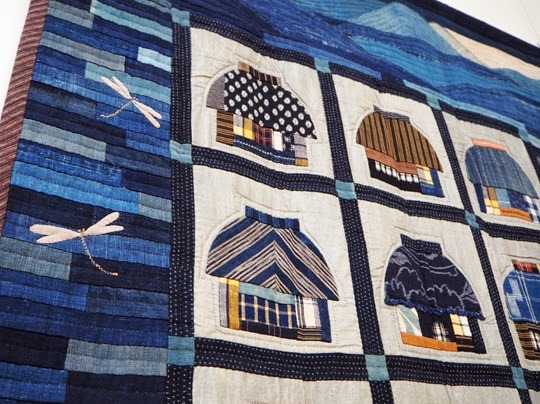 This quilt represents Shigeko's village from her childhood, before the war. She names some of the houses and notes there are lights going on in the early evening – some happy-looking houses, some lonely-looking houses. No. 8 Dusk falls gently. 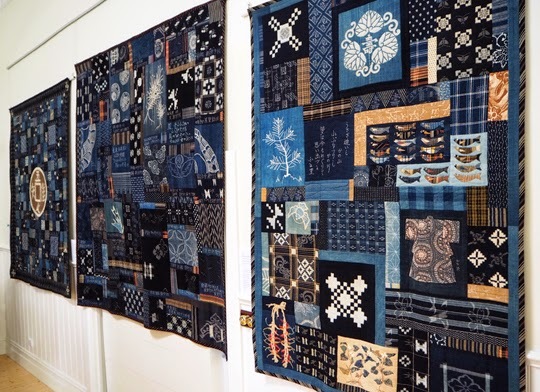 This last one was really just a quilt of textile play – patching pieces of indigo that vary slightly in colour. This is only one half of it, but I think it has such beautiful rhythm and composition. No. 7 Playing with indigo-dyed cloth. One touching little detail was the origami crane sitting in front of each quilt atop the descriptive plaque. There were so many stunning quilts and you can see all 50 on the Millrose Cottage Facebook page – they did such a good job of displaying and hosting the event. You can still also buy the little booklet with the stories of each of the quilts, with money going to Red Cross. Such a beautiful legacy from what must have been a very difficult time. Thank you so much for the link back to the FB page. I had been searching for more info on these quilts since I saw a couple on another blog last week. Beyond stunning. It must have been glorious to see them in person. You're welcome Michele! Yes, the quilts really were special. You're very welcome Anne – it was such a great exhibition. Good to see you again too. Hope you had a lovely Easter. I'm so pleased you suggested that I go with you, Tara.It was a very special exhibition. Two things really struck me. One was the sense of community. When it became known that Shigeko was doing this project, Japanese women from all over donated materials and especially pieces of kasuri for her to use. 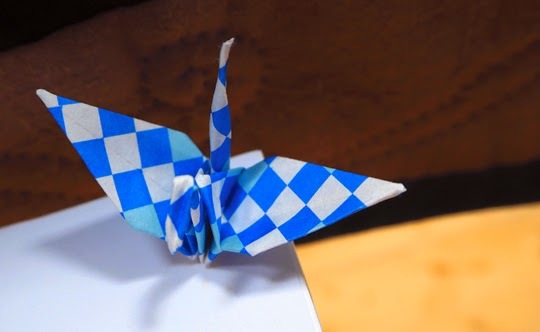 Some of the left over pieces of material were made into bookmarks by members of the Red Cross in Japan and given as gifts to the public on arrival. Ballan was just the right place to exhibit the quilts - a small community where the Red Cross worked so hard to make it such a success. Secondly was the sense of peace. In spite of the number of people viewing the quilts there was an almost palpable feeling of calm and contentment emanating from the quilts. It was very special indeed.